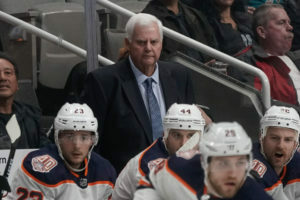 A major theme of the early days since Ken Hitchcock replaced Todd McLellan as the Edmonton Oilers’ head coach is that ‘Hitch-Hockey’ has led to tighter team defense but the Oilers are failing to score enough five-on-five goals to win regularly. Is it true? A seven-goal explosion on Friday night against the Minnesota Wild and six more goals Tuesday against the Colorado Avalanche may have calmed some of the fears about the team’s ability to score, but more often than not with Hitchcock at the helm, the Oilers have been involved in very low scoring games. Central to the argument about the Oilers’ offense is deciding whether the two recent games of seven and six goals (with a 1-0 shutout sandwiched in between) represent a trend in the right direction or a blip in the radar. In the nine other games under Hitchcock, the Oilers have just 10 five-on-five goals scored for a measly 1.11 per game. Over the 2018-19 season, the LA Kings are the worst in the league at five-on-five scoring with 1.50 goals per game. While you can’t discount the impact of single games in every team’s scoring totals, concerns about the Oilers’ goal-scoring are not folly, particularly when you consider that the Oilers are 20th in the NHL in producing scoring chances over the three-week stretch since Hitchcock took over. That the team was still 6-2-1 in those nine anemic games comes from the fact that, as you might expect, their all-situations goals against has dropped from 3.30 per game with McLellan to a whopping 2.27 per game under Hitchcock, a number that would put them first in the league if they’d performed at that level over the entire season. Whether the team is cheating for defense because of, or to impress, their new head coach, and whether ‘Hitch-Hockey’ means low scoring games forever or for now, are two questions we can’t answer with confidence yet. The Oilers have also been riding hot goaltending and perhaps the 8-2-1 record can mostly be attributed to Mikko Koskinen’s amazing work and Cam Talbot’s resurgent play. That said, in most games, the team is starving for goals. While we’ve been told repeatedly that the systems have barely changed so far, the lines have been changing regularly as a result of injuries, roster moves, and Hitchcock casting about for solutions. His process of experimenting for productive lines is something I’d like to explore. As coaches make regular changes to impact the team, we should use more than a win/loss record to assess whether the changes are actually helping. Beyond actual goals, I use the scoring chances count from NaturalStatTrick.com to consider the success of a line, as that statistic is moderate to strongly correlated with winning in the NHL (something I will outline in a future article, but which is discussed to some extent at Maple Leafs Nation and by the Washington Post). *Five-on-five time-on-ice is calculated by Centre with most common linemate unless otherwise indicated. SC = scoring chances. Hitchcock put his first stamp on the lines by forming the infamous ‘Identity Line’, instructing them to hit, cycle, and give up the same or less than they create, and it was effective on day one. He also shifted from McLellan’s preference to roll four lines and found extra ice time for Connor McDavid and Ryan Nugent-Hopkins in the form of double shifts. Those extra shifts saw Nugent-Hopkins/Kyle Brodziak/Zach Kassian score a goal in less than two minutes together, and Caggiula/Nuge/Draisaitl get scored on in just a 30-second stint. No changes here, the Oilers goal came on the power play before the Ducks tied the score on an empty net (with under 20 seconds left) and won the game three-on-three. Of note, McDavid had at least a few shifts with Rattie, Khaira, Lucic and Spooner and was 2-1 in scoring chances away from the ‘top line’. A clear area for improvement after two Hitchcock games would be getting Nugent-Hopkins different wingers, as his line was not providing strong play. There was post-game verbal that Caggiula did something to piss off Hitchcock and because of it, the top line would be changed despite positive results. The line changes here were not positive, with the top line having a weaker game and the new Nugent-Hopkins line playing even in goals but caved in on scoring chances (which explains why their ice time was cut). The checking line (Lucic/Brodziak/Kassian), as I’d prefer to call them, continued to generate and give back no goals. Rattie essentially got taken out of the game as the Oilers’ top three forwards cycled through with the rest of the fourth line. Based on this, you’d expect Rattie to come out of the lineup and the two ‘scoring lines’ to see another change. 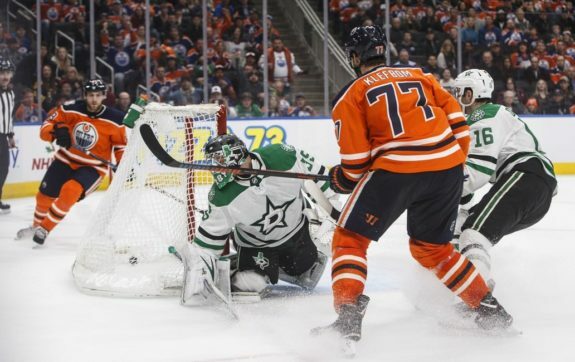 Many changes produced a very low-event game with a shutout heading into overtime where the Oilers won (twice) at three-on-three. None of the lines was particularly effective by these metrics but the goaltending was strong both ways. The checking line bent for the first time but didn’t break. 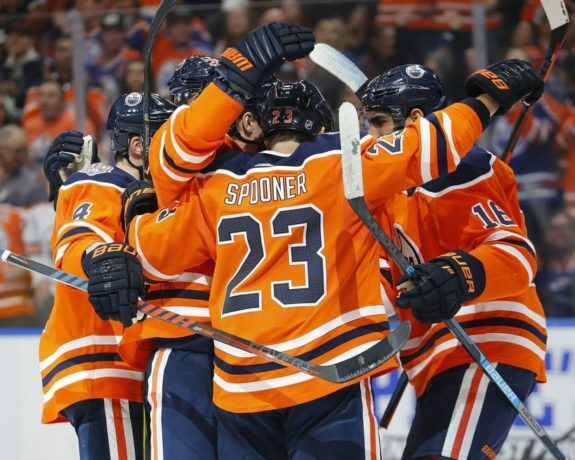 Quietly, Spooner had his first game at centre for the Oilers. These numbers for the top two lines would be concerning over a long period. One interesting note from the top line is the significant difference in ice time between Draisaitl and Chiasson (five minutes at five-on-five), which has been the case in many of the games that followed. After a shutout win (Hitchcock likes those! ), the lines stayed the same and looked a lot better by the numbers. You’d like to see a Nugent-Hopkins (or second scoring) line that earns more ice time as a unit, but we aren’t there quite yet. The Spooner/Khaira pairing played well and they seem to be earning Hitchcock’s trust. Lines were the same again, except Ty Rattie drew in for Patrick Russell and the new fourth line looked great by the eye test and numbers, scoring a huge, game-winning goal in the middle of the third. The two ‘scoring’ lines are not playing consistently enough and could easily be revisited at this time. I’ll skip the assessment of lines for this game, as McDavid was out and the jumble that ensued was not pretty. Best to give the team a pass and start again in a couple days. 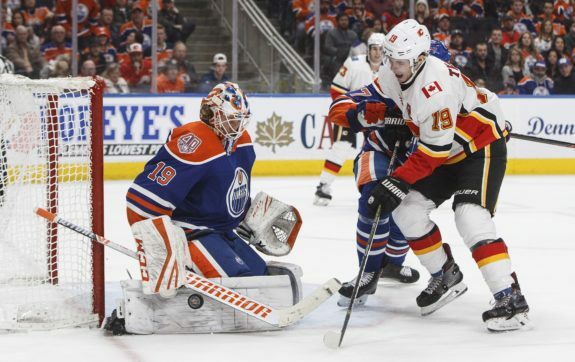 The Caggiula injury sparked a move up the lineup for Khaira, and his trio with Nugent-Hopkins and Puljujarvi produced the team’s only five-on-five goal. The numbers here don’t include Puljujarvi spending 36 seconds with Lucic and Brodziak and going 0-4 in scoring chances, but besides that shift, the team performed well overall (after the first 10 minutes). The fourth line with Spooner at centre continued its strong play with limited minutes. The top line with Chiasson on it had its only truly dominant game so far, which probably bought Chiasson some more games in that spot. Another good looking night for Khaira on the second line, as, in addition to what’s shown above, 28 seconds with Nugent-Hopkins and Chiasson produced a goal as well. The checking line became the fourth line in ice time for the first time, as Spooner at centre along with Rattie and (now) Zykov passed the math and eye test. A Lucic fight and 14 minutes of unproductive power play time meant the five-on-five ice time was down across the board and there were some mixed combinations throughout the game. The top line continued its mediocre flow of play but a beautiful goal by the trio was all Mikko Koskinen and the Oilers needed. Lines 2-4 showed well by scoring chance metrics, and Hitchcock again increased the ice time of his checking line in this tight game. The biggest plot twist from Tuesday night’s game was the splitting of Hitchcock’s only consistent line, as Lucic and Khaira swapped spots early on. Though Lucic was impactful in setting up a goal by Nugent-Hopkins in 10 seconds while Kassian was on the ice, his new line with Nugent-Hopkins and Puljujarvi was not effective through most of the game and Brodziak’s modified line got significantly more ice-time. Brodziak and Kassian also produced a goal with Draisaitl and a couple scoring chances with a smattering of other left-wingers. The fourth line was neither highly involved nor successful and appears to be the next target for an overhaul despite some decent games. The Oilers under Hitchcock have earned 17 out of a possible 22 points in the standings and those are the only numbers that truly matter. In the long run, however, there are other metrics, such as scoring chances, that serve as decent predictors of future performance. This review of the forward lines shows that certain players have been gaining Hitchcock’s trust, including Jujhar Khaira, Kyle Brodziak, and at times Ty Rattie and Ryan Spooner, and that, to the delight of many Oiler fans, ice time appears to be given and taken away based on performance. Nonetheless, in the past 11 games, the team at five-on-five has produced 224 scoring chances for and allowed 253 against, suggesting they need more reliable performances from the group playing in front of Koskinen or Talbot. The breakdown of each line from each game shows that Alex Chiasson may not be the ideal fit on the top line, and you’d also hope to see wingers and production that would encourage more consistent five-on-five time for Nugent-Hopkins. He has often been on the third line in ice time despite being a key player and clearly a favourite of the new coach. The Oilers would also be well-served by a third scoring line (perhaps centred by Spooner) that could produce offensively if the Brodziak line is destined to serve in a zero-sum checking role, despite their goal-scoring outburst on Tuesday night. In the coming weeks, I’d like to see some evidence that Hitchcock is still adjusting the lineup to find better and more productive fits across multiple forward lines. Given the various mixtures that have produced great results and decent scoring chance numbers in the past week, including a four-game winning streak with 16 goals scored (13 at five-on-five), it will be interesting to follow his choices as the Drake Caggiula and Tobias Rieder return to add some depth to the winger positions and provide some new options.